These gold earrings are comprised of beautifully scripted letters that form a truly unique monogram. The 14K White Gold Monogram Earrings make the perfect gift because of their deep meaning. Receiving a personalized piece of jewelry is like telling that special someone how much you really care and pay attention to her. These gold earrings are just the right size to wear for so many different occasions and to complement endless styles and outfits. The three letters in the monogram are placed side by side to form a set of initials that make up the entire design of the earring (18mm x 15mm). Decorative curls and tails are added to each letter to create a truly eye-catching design that at times can trick the eye into not even noticing the monogram at first glance. The letter that sits at the centre of the monogram has a gold hoop at the top, attaching to a gold ball stud with a push-back post. These earrings are easy to put on and remove, and are polished to a beautiful finish to highlight the gorgeous white gold. 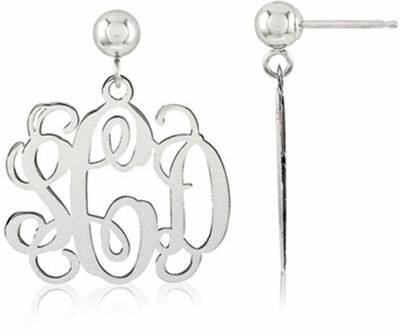 These monogram earrings can brighten up a rainy day for someone who needs a little pick-me-up. Not only are these gold earrings a beautiful gift, but the monogram is a unique expression of fashion and individuality. Earrings measure 18mm (11/16") x 15mm (9/16") not including posts. Including posts earrings measure 22mm (7/8"). We guarantee our 14K White Gold Monogram Earrings to be high quality, authentic jewelry, as described above.